*Within the third chapel on the right side of the nave is a painting of the Presentation of Jesus. To the sides of this painting are two works completed by Michelangelo Cerruti depicting the Annunciation and the Immaculate Conception. *This church is west of the Basilica of St Mary Major. It was originally an Arian church. However, in 593 after the Imperial forces defeated the Arian Goths the church was reconsecrated to St Agatha. *This church is located in Trastevere. It is not open often. *A painting in the sanctuary depicts the martyrdom of St Agatha. *The fourth chapel on the left side of the nave is dedicated to St Jerome Emiliani. The community that he founded, the Somascan Fathers, administer the parish. *The church is very small and is set into the surrounding buildings. It is dedicated to both St Benedict and St Scholastica. It is not open often. *This church is west of the Spanish Steps and near the Tiber River. *This church is near the Spanish Steps. It is run by the Servite friars. *The third chapel on the left side of the nave is dedicated to the Seven Holy Founders of the Servite Order. *This church is located north of Piazza Venezia. *A chapel on the left side of the nave near the entrance is dedicated to the Seven Holy Founders of the Servites. *This church is served by the Servite friars and the Order’s Generalate is adjacent to the church. *This church is located in the Roman Forum above the Mamertine Prison. It was in this prison that the Romans incarcerated individuals of great importance. As a result a long standing tradition has placed St Peter’s imprisonment here. 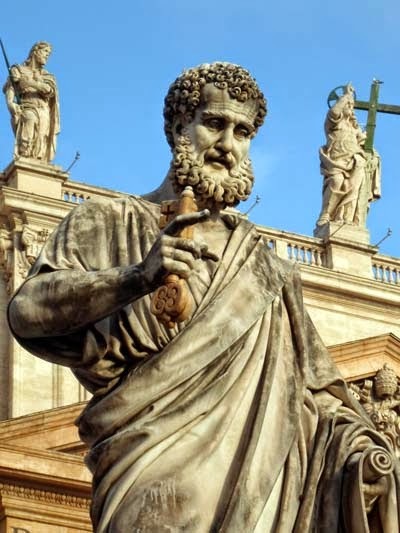 Such a high profile imprisonment would seem likely from today’s perspective, however, at the time of St Peter’s death his role as the leader of a little-known Jewish sect would have almost certainly been regarded as insignificant. As a result his imprisonment at this location is doubted. Nevertheless, this prison continues to actively promote tours. Within St Peter’s alleged cell is a raised ring that is believed to be the spot where a spring of water arose allowing St Peter to baptize two guards. *A tradition claims that St Peter was condemned and imprisoned near this site. This tradition is probably more credible than the one held at the Mamertine Prison. *Venerated within the confessio of this church are the chains of St Peter. A tradition holds that these chains are a result of the chains from St Peter’s imprisonment in Jerusalem coming into contact with the chains from St Peter’s imprisonment in Rome. Miraculously these two chains were fused into the one inseparable chain that is now found in the confessio. *This church is near the Basilica of St Mary Major. *Within the main sanctuary of this church is a painting by Vincenzo Camuccini entitled the Crucifixion of St Peter. This is a copy of the original that was done by Guido Reni. This painting recalls a mistaken medieval tradition which placed the martyrdom of St Peter at the location of this church and not at St Peter’s Basilica. This tradition, which has in modern times been disproved, led to the construction of a small circular chapel within the cloister adjacent to this church. This chapel, called the Tempietto, is considered one of the best examples of Italian Renaissance architecture in Rome. It was designed by Bramante in the early part of the 16th century. Special permission is needed to access this chapel. *In the Cerasi Chapel, to the left of the main altar, are two works by Caravaggio. The one to the left is entitled the Crucifixion of St Peter. *This church is located west of Piazza Venezia near the Fontana delle Tartarughe. It is set behind some buildings and is not easy to notice from the street. It is not open often. *The relics of St Polycarp are set in a marble memorial stone under the main altar. *Tradition also holds that this church rests on land that was formerly the location of a house owned by St Ambrose’s father and occupied by his older sister.